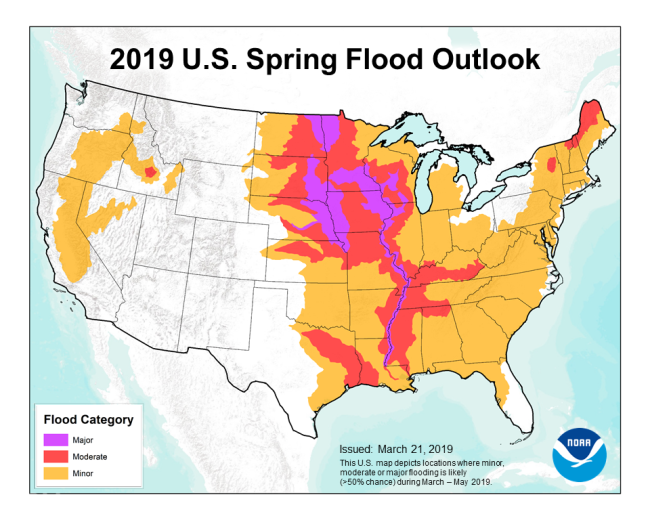 More than 200 million Americans are at risk for some kind of flooding, with 13 million of them at risk of major inundation, the National Oceanic and Atmospheric Administration said in its spring weather outlook . About 41 million people are at risk of moderate flooding. This map depicts the locations where there is a greater than 50-percent chance of major, moderate or minor flooding during March through May, 2019. The Missouri River has already set records with historic flood marks measured in 30 places in Nebraska, Iowa and South Dakota, Kansas City forecaster Kevin Lao said. The river "remains vulnerable to moderate flooding for the remainder of the spring and early summer," Lao said. "People should be prepared for major flooding along the Missouri River ... going into the future." In November, the fourth U.S. National Climate Assessment warned, "Flooding may intensify in many U.S. regions, even in areas where total precipitation is projected to decline."